The Poptart Manifesto by Rick Gualtieri: Vodka Sauce Recipe? Da, Comrade! Happy day after Christmas all! I hope your holidays are going swimmingly. If so good deal. If not, then perhaps a little good food will put that pep back in your step. Well ok, that might be over simplifying things a bit...but hey, I’m just a writer not a psychoanalyst. So as I promised during the intro to the Teaser 2 for Bigfoot Hunters (which if you haven’t read yet...go do so! No Vodka Sauce for you until then! I’ll wait. 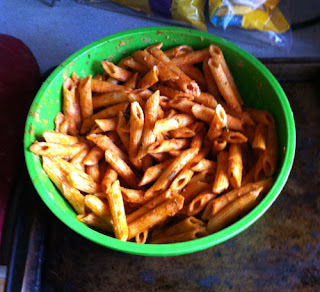 :) , here, as a sequel of sorts to my Chili Recipe, is my recipe for Vodka Sauce (insert riotous applause). Fortunately, unlike my Chili recipe, this isn’t an all day affair. You can prepare this and be eating in about a half-hour. It’s a nice simple recipe, really hard to screw up unless you’re a total incompetent and if you are then chances are you’re still sitting there trying to find the On switch of your PC rather than reading this. Quick note: All spices listed below are approximations. Please adjust to your own tastes. For example, if you don’t like garlic, use less, etc etc. If you have no idea what your tastes are, then my suggestion is to stop right now and go get yourself a Big Mac. Leave the cooking to the big boys and girls. * Another note: (yes I’m going to keep doing this!) the time to make this sauce is almost a perfect match for the time it’ll take to make a pound of pasta. I’d recommend starting them at the same time. Just my $0.02. Makes: Enough to literally drown a pound of pasta is you’re like me and like plenty of extra sauce to mop up with garlic bread. However, if not, then easily makes enough for a pound and a half. Anyway, in a medium sized sauce pan: toss in the Olive Oil, Butter, Garlic, and Basil. Turn on stove to a medium flame. As the butter melts, stir to combine into slurry of sorts. Add in a generous coating of Pepper, a pinch of Salt, and a coating of Onion Powder. One it’s heated and mixed (you’ll smell it...and it’s a GOOD smell), add in the vodka. Reduce for a few minutes. Note: DO NOT reduce down to nothing. You want to reduce about half way until it thickens up a bit. Add Cream. 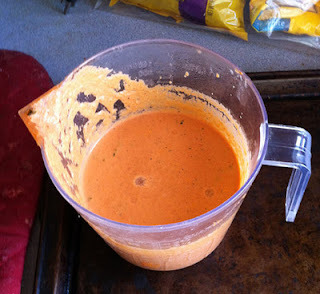 If you like a lighter color/creamier sauce add 2 cups. If you’re more of a tomato sauce type of person, then add 1. Stir until fully mixed. Reduce heat (about half way) and let it heat up. You can bring it to just a boil, but DO NOT over-boil. Add 1 can of Tomato Sauce. Stir until it’s completely mixed in. Repeat with the second can. Here’s where you’ll want to start spicing things up a bit. As you mix it together and it heats up, perform a few tastes tests. By this point it should start bubbling a bit. From here on out you’ll want to mix CONSTANTLY. Failure to do so will burn your sauce. Stir until the Paste is thoroughly mixed in. This will thicken the sauce slightly. Next start adding in the Grated Cheese. Add about half and then stir in until it’s melted. Repeat with the rest. If done correctly your sauce should be a pinkish / orange color and should be thick enough to let your kids use as paste on their next school project. Turn off the heat and finish whatever the rest of your meal will include. Finally eat it...preferably with some pasta. Works with just about anything: Penne, Ziti, even Spaghetti. Garlic bread makes a hell of a side too for it. When you’re finished, you can refrigerate for a few days and then just nuke it to your heart’s content. Enjoy with my compliments. Should you try this recipe, please let me know how it goes. If you like it, please share it with others. If you like it a lot, feel free to use it and claim it as your own to friends and family...it's ok. We'll both know the truth. Excellent! If you wind up doing so, please let me know how it turns out.